1. REVA' Auto-Tile Press Machine, Model : RTP-3,Powered by 7.5HP Electric Motor of Hydraulic Control Unit, Production Capacity 4000 to 4500 pavers per shift. Controlled by Mitsubishi PLC , Hydraulic Pressure 2500 to 3000 psi. The Capacity of Hydraulic Oil Tank 250 Ltrs. 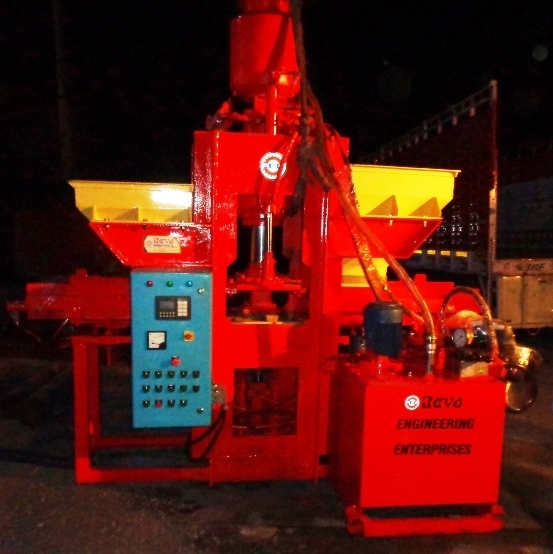 Automatic Concrete Material Feeder and Fine Material for Top Layer Feeder in the Mould. Automatic Pressing and demolding of Tiles/Pavers. 2. Pan Type Concrete Mixer 250 Kgs, Powered by 7.5 H.P. Electric Motor with starter. 3. Belt Conveyor of 25 Feet to Feed Raw Material from Mixer to Machine. 4. Pan Type Color Mixer, Powered by 02 H.P. Geared Motor with accessories.